I have had one paranormal experience with a Parker Brothers INC. of Salem, Mass., QUIJA® board, and one with my own handmade board that I will not soon forget! October of 2005 I went to the local Toys R' Us. I was there just enjoying myself looking around, and then I came to the game section and saw the Mystifying Oracle Ouija board game made popular by William Fuld stacked neatly on the shelf. Personally I didn't know much about them at the time; I just knew it was supposed to be only just a game and nothing more. I read the box, the price was right, so I purchased it. Well, I thought to myself, my curiosity is really piqued and I wondered if I could do this alone. The instructions, or directions state that: You should place Ouija® talking board upon the laps of two persons facing each other, lady and gentleman preferred. I then thought to myself, Well it's worth a try: What could happen out of the ordinary? So I took the stylized planchette and placed it on the Ouija board as per the instruction. I then read further: “As it passes over Ouija® talking board each letter of a message is received as it appears through the transparent window covered by the message indicator. I then took my fingers, touching it ever so lightly and I started saying aloud " Is someone there... Is someone there?" I said that about 8 times. Nothing happened. I started saying "Is anybody out there?" I said it for a short while, about 10 minutes. And then all of a sudden, I felt a strong, strange presence in my room!!! I knew I was all alone but It felt like it came out of the Ouija board and into my room surrounding me! Its presence was, from what I perceived, on the ceiling in front of me. I was so scared that I took the Ouija board and threw it in the garbage. I was very shaken and felt very, very strange. I didn't get to sleep that night. Later the next day I felt much better, and I never felt the presence again. Five months passed and I began to have this strong urge to make my own handmade Ouija board. The feeling was so strong and the urgency of it overwhelmed me so I gathered what I needed to construct it -- which I did post haste. The actual haunted paranormal urge was so strong that I couldn't wait each day to get home to finish it! After I finished my handmade Ouija board, I had this strange feeling about using it. It was like a warning not to use it! On 3/8/06 I woke up at 5:40am, and I had to use my homemade Ouija board. I set up my camcorder in the closet facing me. It was recording everything to my dvd recorder with built-in 160gb. My video is live on goggle video, Ouija personal experience. At 6:00 am I lite a single white candle and put my original homemade spirit calling Ouija board on my lap, and then I put the planchette I made on the board and then my fingers oh so lightly upon it. I started by going around in slow circles for a minute or two. And the I stopped and started saying " Is someone there?" I said it about 8 or so times. And then I started saying "Is anybody out there " I said this about 27 times or more. I than I said something towards the end. " If there's any spirits out there do something" I said that just twice. out there." When I said it the 5th time, the candle went out instantly! I jumped out of my chair to turn the lights on. When I looked at the candle, the stem of the candle was flat down. Almost as if someone deliberately pressed it down with their finger. 4 hours after my experience. A friend of mine asked me, if I could make a backup copy of music cd. I said yes, so I scanned the front and back cover and clicked print. When it came out their were drops of red ink scattered on both cd covers. Which was strange after my experience. I looked at each cd cover with a magnifying glass,and I noticed their were 6 drops of red ink on each cd cover. I also noticed that each drop was smeared to the left. After that very odd strange things started to happen to me. I started hearing banging noises on the wall, and my lights started to flicking. After what happen I want it to share my experience, so I upload my video to goggle video. What happen on 3/25/06 was the worse thing that to ever happen to a person. I woke up at 3:22am, I was about to sit down on my chair, and check to see if my video was live yet. And than all of a sudden, I started shaking and feeling cold, and my teeth were chattering. I than I felt something going inside me like air, it had a tingling sensation. It only lasted about a minute or so, and than it went away just as fast as it came. I couldn't even move. After that I keep seeing red, I keep seeing Margaritas Madness in red, every time I went to check my photos at webshots.com. I also had a dream that a was watching tv, and the bottom of the screen their were red coming up and it covered the entire screen, to me It looked like real blood, I was really scared! I thought that something was going to happen to me!I told my sister about it, and she said to get rid of it ASAP! I went online and looked up paranormal investigation. I looked page by page and than a saw the paranormal investigation of New York City. There were 2 numbers one of them was an emergency number. I wrote the number down and called them. I was talking to Dom for a half an hour He's the head of the paranormal investigation of NYC. He told me I have to destroy it, and everything will go away. some holy water. After that I went to home depot to buy a shovel, because my board was 15x20 and 1/2" thick. 2 blocks away from where I lived at, their was a park. On the other side of the park their was a small mountain about 3 stories high. I climbed halfway up and I noticed their was a few dead trees and a lot of dirt around them. I went back down and got the Ouija board and the shovel& saw and went back up. I cut the board into four pieces and dug a hole a foot deep. I put each piece inside and sprinkle each one with holy water! When I got all the pieces inside, I sprinkle everything with holy water and than buried it! Their was a pile of leaves on the other side. I threw the leaves on it so, you couldn't tell where it was! The next day I felt much better! Their were 2 entities, but the other one was really bad. The first entity is still here, because a didn't destroy it I threw it in the garbage. That's the one that I purchased at Toys R' Us. My video is live on goggle video. Ouija personal experience. What happened on 3/8/06 from 6:00am through 6:24 am is the REAL DEAL!!! NOTE: The first entity made the candle flicker in the beginning of my video! And the second entity that came through at the end made the candle go out! This first spirit had a strong influenced on me! And it's still here!!! If you go to the web, and lookup paranormal investigation of NYC. Go to their site to the left you will see meetup click on it. Picture from the Paranormal Investigation of NYC, I'm the first guy on your right. I destroyed my homemade Ouija board 8 days later after the entity went inside me, I also got blessed by a priest. Note: When I'm watching my Ouija session from dvd recorder with built-in 160 gb. Each time it reach's the next minute and 10 seconds, the tape counter starts going backwards to 22! world. At least that's what I've learned. 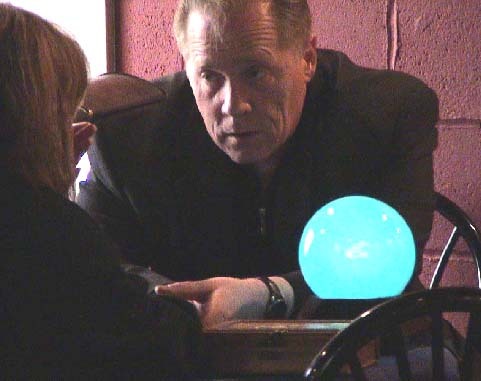 Ghost Hunters, Near Death, Afterlife, OBE, ESP, Ghost & Spirit Contact. We are American Ghost Society (AGS) Representatives for New York City. We are a not for profit organization. We do not charge for investigations. HAVE YOU HAD A PARANORMAL OUIJA BOARD EXPERIENCE?